The KingCamp Oversized XL Zero Gravity chair [Amazon Link] is a mighty outdoor reclining chair, indeed! It is quite sizable and is capable of supporting up to 300lbs of weight. It’s also super comfortable, and extremely convenient to use. This chair is a Zero Gravity chair, featuring a steel frame with a bungee cord wrapped around it. The cord is intertwined with an elegant, soft 600D Oxford fabric, which forms the seat support. It is super comfortable! 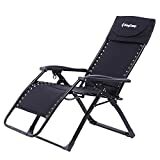 This article is a KingCamp Zero Gravity Chair Review and looks at all of the details on this high-quality piece of portable indoor/outdoor furniture. Note: KingCamp has supplied OutsideModern with this chair for review. All of the opinions expressed in this article are wholly our own. 1.3 What is a Zero Gravity Reclining Chair? 1.4 Who Needs the KingCamp XL Zero G Chair? 1.5 How Does the KingCamp Chair Work? 1.6 Is the KingCamp XL Chair Comfortable? With a 300lb weight limit, the King Camp Oversize XL Zero G Chair provides great support, solid style, and a ton of convenience! Portable folding, reclining chair! Take it to the beach, the park, camping, etc. What is a Zero Gravity Reclining Chair? Textiline fabric chairs, similar to what is commonly found on a swivel rocker patio chair. What makes the Zero-G chair unique is the way the fabric is attached to the frame. A Zero-G chair uses a bungee cord design to secure the fabric to the frame, resulting in an incredibly natural flex in the chair, and absolutely no pressure points whatsoever. Combine the bungee cord design with some serious reclining capabilities, and you’ve got an incredibly comfortable chair! For this reason, these chairs are commonly used by those in medical rehabilitation, as they are so comfortable, and so easy to get into the exact position. They are great indoors, and great outdoors. Who Needs the KingCamp XL Zero G Chair? The KingCamp Oversize XL Zero Gravity Chair is ideal for those who want a super comfortable outdoor recliner, and are on the larger size. With its 300lb maximum weight limit and XL form factor, this chair is ideal for big and tall folk. That said, if you’re not so big and tall, getting the oversize chair may be unwise, as it can be a bit unwieldy to carry around, even in its folded position. With a weight of 22.5lbs and a substantial 3′ x 2′ folded dimension, it may be difficult for those with a smaller frame to move around. If you or your guests are on the larger size, the Oversize XL chair is a must. If you or your guests are not, then a smaller form factor (such as the smaller and lighter KingCamp Textiline version) would likely be preferable, due to portability issues. How Does the KingCamp Chair Work? The KingCamp Oversize Reclining Chair arrives in a box, and there is no need for any setup whatsoever. Simply unfold the chair as you would a traditional webbed lawn chair, and place it on the ground. As the legs are square, the KingCamp will balance pretty well on uneven ground. There are no issues with sinking into sand or dirt, as there would be with individual-leg chairs. Operating the recline system is quite simple. Underneath the armrests are two circular safety locks, which lock the chair in position. By pulling down on these safety locks, you unlock the chair, and can easily recline to your desired angle. From there, pull the two toggles back up, and the chair will lock into position. In the photo above, the right side (closer) is locked, while the left side is unlocked. For those who are using the chair for medical purposes and who don’t have strength in both arms, it is possible to lock the chair only on one side. However, it would only be half-locked, and really should be locked on both sides if at all possible. In our tests, with only one side locked, the chair stays in position, but it’s possible that with more weight, it may move. The worst thing that would happen in the event of unintended chair movement is that the person sitting would likely change to a completely reclined position. Is the KingCamp XL Chair Comfortable? Absolutely! This reclining chair is extremely comfortable, and for those who tried the chair for review, the opinion was universal: all were quite surprised that this chair reclined as much as it did, and that it was more comfortable than they expected. The fabric mesh supports body weight quite comfortably, with no pressure points, lumbar issues, and the like, and the overall design is quite well thought out. When fully reclined, you are positioned almost horizontally and will be looking directly skyward, or through the branches of the trees above, depending on your location. When fully upright, users are positioned as they would be in a typical chair, and eating, drinking, and the like are quite comfortable. And if you want to be somewhere in between, you can! When you find the ideal angle for your comfort level and the environment, you can lock the chair in that angle, so you have complete control over the recline level, which is a great feature. As the KingCamp Oversized XL chair is made for those with a big frame, the chair itself is pretty large. This makes it less portable than other chairs on the market, which may be an issue for those with marginal health issues, strength issues, etc. As this chair weighs over 22lbs, it’s pretty heavy. Consequently, carrying it to the beach or through the park may be more difficult than other chairs would be. Obviously, the designers need to build a larger chair to accommodate those who have a larger frame. However, if you’ve got a few extra pounds, but don’t have the extra strength to go along with those pounds, you may find this chair to be less portable than you’d like. The KingCamp Oversize XL Zero Gravity Chair folds up pretty easily, using the same locking system to collapse the whole chair into a small form factor. It’s pretty easily stored, very much like any traditional folding patio chair. A detachable side table would be a real help with this chair, and the Prime Products Utility Tray works well with the KingCamp XL. If you’re using the KingCamp without other tables nearby, such as while camping, at the beach, etc., a side table is a must! The KingCamp Oversize XL Zero Gravity Chair is perhaps the most comfortable outdoor reclining chair we’ve sat in and is a very high-quality chair. KingCamp did a great job producing a solid, sturdy, well designed indoor/outdoor reclining chair for those who have a large frame. Our biggest issue with the chair is that its size and weight makes it a bit less portable than some other folding outdoor chairs, but this is necessary in order to make a chair capable supporting larger individuals. Additionally, we wish it came in more color options than just black (though the black looks great). Overall, the KingCamp Oversize XL Zero Gravity Chair is an outstanding folding indoor/outdoor recliner, and you can be pretty sure it will be the first chair everyone goes to claim when you’re headed to the patio!